Housetraining is part of being a responsible pet parent, but for some dog owners this task can come with obstacles and headaches. Adjusting to and overcoming these challenges can be difficult on both the dog and the owner. Thankfully, recent developments in the dog toilet industry offer pet owners more options. What Is An Indoor Dog Toilet? The term “indoor dog toilet” can refer to a few different products. The most popular indoor dog toilet is the Pet Park. The Pet Park concept focuses on providing an indoor section of faux grass where dogs can use the toilet without having to go outside. If you want an easier clean up and less smelly one, take a look at the BrilliantPad. Another more recent trend is the use of a dog litter box. Some dog breeds are particularly adaptive to litter box training. The grated pet toilet is another option that provides indoor toilet facilities for dogs by providing a tray fitted with a grate. Potty pads are another method for indoor toileting; this option is generally utilized by dog owners when they are housetraining their dog. Diapering is another solution that is considered by owners of elderly dogs; however, this is less of a “toilet” and more of a means of containment. The Pet Park and similar types of indoor toilets are designed to simulate a patch of grass. This faux grass is fitted over a tray so that any urine can be trapped below the “grass” in a plastic tray that can easily be washed clean. One of the biggest benefits that pet owners find with the Pet Park system is that it does not allow urine to soak through to the flooring and it provides a more natural “potty” environment for the dog. These factors make it a popular indoor dog bathroom choice. Many dog owners choose to utilize the Pet Park system because it offers a more hygienic method for toilet training than other indoor toilet methods. Even when used, the “grass” top to the potty area quickly drains to create a dry surface which prevents your dog’s paws from becoming urine soaked. See how the Pet Park works in this video below. The BrilliantPad cleans itself. It is plugged into an outlet and automatically advances the roll 1 to 3 times per day, depending on what you adjust it to. One roll is similar to 27 traditional potty pads, so you can go days or potentially weeks without changing the roll. The roll soaks up urine and begins to dry out poop. It then wraps and seals the waste to keep your home from getting smelly. Once the roll is all used, you can dispose the entire thing. The rods and end-caps are treated with EcoPure, which allows it to biodegrade in most landfills. Litter box training is a method of indoor toilet training for certain breeds of dog.Just like with cats, dogs are provided with a larger litter box tray filled with litter. Dogs can easily be trained to use the litter box with a little positive reinforcement. It should be noted however, that litter box training is not the right option for all breeds of dog. Larger dogs will have a harder time because litter boxes are generally built with cats in mind. Litter box training is also not a good option for some breeds of dogs, specifically those that love to dig or who can be destructive. In the case of these dogs providing a litter box can be a messy experience. Litter boxes are affordable and available widely. Certain dog breeds do very well with litter boxes including most small breeds and sharpies. While the majority of litter boxes on the market today are aimed toward cat owners, there are a select few companies that specialize in dog litter boxes. Grated pet toilets are similar to the types of flooring seen in pet stores. These indoor dog toilets combine the idea of having a tray underneath the toilet to catch urine with a grate on top of the tray to allow the urine to drain from the top surface so the dog isn’t standing in it. While this idea is similar to the idea of the Potty Park, it does not provide the comfort that is offered by the grass like surface of the Potty Park option and also does not allow the dog to associate the toilet with outdoor potty time. Often these types of toilets combine potty pads inside the tray to absorb urine, but some simply provide a tray to hold urine until it can be emptied. Potty pads are an indoor toilet solution that many dog owners use when first housebreaking their dog. Potty pads are thick sheets of diaper-like material that are placed on the flooring in a particular area of the home. Usually these pads are placed close to the door to encourage the dog to go to the door when they need to go to the toilet. Potty pads are one of the messiest solutions for indoor dog toilets because they can leak on the floor and are difficult to pick up without “spilling” the contents of the pad. If your dog does miss, you will need to sanitize the area with pet-friendly, odor-reducing cleaners. One of the benefits to potty pads however, is that unlike other indoor toilet options, these pads provide an option if the dog needs to defecate while on the go.When used for defecation, these pads remain in place and can be rolled up or picked up without leaving traces of feces behind. Grated toilet solutions on the other hand leave trace amounts of feces behind that must be cleaned thoroughly before any waste material dries or becomes stuck on. See more pee pad reviews. While diapering is not necessarily an indoor toilet option, it is an option that many dog owners turn to when their dog is experiencing problems with incontinence. More often than not, when dog owners turn to diapering it is due to the fact that their dog can no longer control their bathroom functions rather than the dog having to wait for too long before going to the bathroom. Diapering is not recommended for dogs that do not have difficulties with controlling bathroom functions because it can lead to additional complications. As with human children that wear diapers, dogs can experience rashes and irritation from waste material being held close to the skin for an extended period of time. Diapers are also very restricting of a dog’s movement and are particularly expensive. Since diapers are not a recommended solution for dog indoor toilet options, we will overlook the pros and cons of using them. In most cases, individuals mistakenly believe that these indoor toilets are being used because owners are too lazy to take their dog outside or are too cheap to pay someone to let their dog out if they cannot come home at lunch time. In the majority of cases however, this is simply not the case. One of the biggest factors for dog owners that invest in indoor toilet options is their pup’s inability to “hold it”. In some instances as our canine friends older age, they lose the ability to hold their bathroom functions for as long as they once could. This disorder is commonly referred to as urinary incontinence. This loss of control can be embarrassing and shameful for the dog as they go from being a well-trained dog to having accidents like they did as a puppy. Providing an indoor toilet allows an elderly dog the ability to use the bathroom when they feel the need without having to wait for you to come home from work. In some cases the inability to hold urine or feces can also result from surgery or injury. Many dogs have fears, but for some, these fears are so powerful that they inhibit the dog from going outside to use the bathroom. Two of the biggest fears that lead to this type of behavior is fear of thunderstorms and fear or simply dislike of the rain. In these cases when the weather is unfavorable the dog will simply refuse to go outside even if they are desperate to use the bathroom. Providing an indoor potty option can help these dogs alleviate themselves and reduce the likelihood of damage caused by waiting too long to use the bathroom. It is also important to understand here that many owners try to force their dog to overcome a fear by dragging them outside in unfavorable conditions. 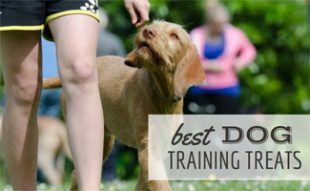 If anything, this type of “training” is detrimental to the dog’s health and may even teach them not to go to the bathroom at all so that they continue holding it for so long that they cause internal damage or have an accident. A significant portion of dog owners work outside of the home and this means that at some point there is a pretty high likelihood that overtime or an extended project will come up. There are times when the boss requests that a project be completed and we simply cannot refuse while knowing that our dogs are at home desperate to use the bathroom after being home all day. In some cases pet parents may call a neighbor to help or they may have a dog walker on call. In other cases where these options are not feasible, an indoor dog toilet provides a peace of mind. Dogs will no longer be forced to hold it for inordinate amounts of time and accidents due to over-waiting will become a thing of the past. In all fairness it is not only puppies that need housebreaking, very often adult dogs require a few lessons as well and indoor toilets are a great way to do this. When homeowners cannot be home constantly to help reinforce potty training and housebreaking, indoor toilets provide dogs with somewhere to alleviate themselves. If placed in a strategic location these indoor toilet options can train dogs where they need to go to signal that they need to go out once the toilet has been removed. Not every dog owner has the ability to go up and down stairs or to take their dog out to the bathroom multiple times throughout the day. Indoor dog toilets give dog owners with limited mobility issues the peace of mind that their dog can go to the bathroom whenever they need to. Choosing an indoor toilet not only decreases the potential for discomfort in the dog, but it also reduces the dependence of a dog owner with limitations upon other people to care for their dog. Just like dog owners may have mobility problems, some dogs also have such issues that can affect their ability to go outside to use the bathroom. Commonly, as dogs age, they develop arthritis and other joint discomfort, which can limit their ability to walk. 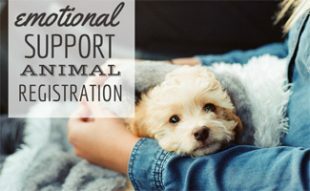 Particularly in cases where these dogs live in apartments that require climbing multiple sets of stairs, these health conditions can cause a significant degree of pain. It is not to say that these dogs should not be taken outside to use the bathroom, but an indoor toilet can reduce the number of times a special needs dog has to climb up and down stairs aggravating their condition. While all indoor pet toilet options provide dogs with a bathroom solution, all of these methods are not equal. Depending upon your dogs needs and your particular situation you may find that one of these options suits your needs better than another. With that said however, it is important to remember that no matter which indoor toilet option you select, that you always take the proper sanitation methods into consideration. Failure to properly clean and sanitize an indoor pet toilet will not only affect the health of your pet, it can also affect your personal health. The biggest key in keeping a clean pet toilet is to clean it frequently. Every day (or more than once a day) cleaning is recommended if the toilet is used regularly. This cleaning should involve emptying out any waste contents into a toilet, sink or garbage bag and rinsing off the toilet itself. Rinsing should always be done with a detergent of some sort in order to eliminate odor as well as germs. Most pet parents use hot water and dish soap to cleanse the toilet,but some prefer to utilize pet-friendly cleaners to thoroughly scrub the toilet. Pet-friendly cleaners ensure that your pet is not being exposed to any harmful chemicals. If you are not dedicated to a regular schedule of cleaning you should not consider having an indoor toilet option for your pet. Improper cleaning of indoor dog toilets can result in a buildup of fumes which are not only harmful, but can result in a wide range of problems both in the home and in terms of overall health. Guests will no longer frequent your home and, soon enough, you will begin to experience the negative health effects of overexposure to animal waste. Once revealed to the authorities that you are living in unsanitary conditions your pets and children may be removed from the home and you may also be prosecuted for putting lives at risk. Indoor dog toilets are made to be easy and fast to clean which means that there is no excuse for not doing so. With appropriate care, indoor dog toilets provide a valuable service and eliminate a series of concerns. We share more some other tips for how you can successfully housetrain your dog. If you’ve got advice to share with others make sure to post them in the comments. Housetraining a dog can be a stressful time, and we’re sure our readers would appreciate your help! 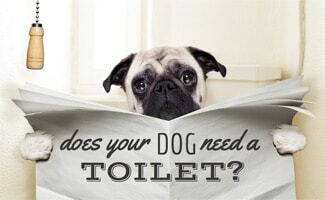 Why are you considering using an indoor pet toilet? Very small dog that gets up multiple times in the night. I would like to know where Kimberly got her information from. Did she used the different perpads with a number of dogs or did she obtain the information from the packages and reviews on Amazon or some other place..
Great question, Kay! You can read about our review process here. My pug lifts his leg to pee on everything. I have a broom next to his fake grass things. He ignores the pad and always goes on on the broom. Is there a product like a cat scratch post with a mat under it. It could have peel off surface. Let me know. I have recently adopted an adorable rescue cockapoo about 2-3 years old. He is very well-behaved and sweet! He is trained to urinate outside but he does not seem trained for poop. He has only pooped on a walk a few times. Instead, he runs off into a private place in the house and poops. At first, there did not seem to be a preference for location but we have been shutting doors and he is narrowing this down to a particular room. I am considering purchasing a litter box to try to train him to poop there. Does anyone have experience with this particular use? Recommend we try this approach? Other ideas? 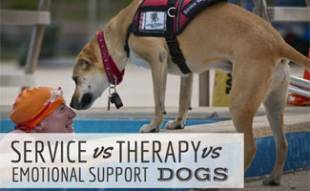 I have a Service Dog and I use ‘Poo-Pee Pads’… SO easy! Wipe their backsides with a baby wipe and put it all in a biodegradable disposal bag – no mess – no fuss! My current SD is a small female, but my previous SDs were large male dogs and they even peed in a bag!!! – It ALL made traveling (hotels,etc.) REALLY easy! You might want to check for urinary tract infection too. Frequent urination can be solved sometimes with antibiotics and cranberry.